SMi are delighted to have interviewed our speaker Alan Kennedy, Founder and Executive Director, Pharma TeamUp regarding his throughts and experiences within the cold chain space. With extensive cross-sector experience, Alan has been focused for the past six years on bringing best-collaboration practice to pharma-logistics. He is a supply chain consultant specialising in supply chain dynamics and is founder and Executive Director of Pharma TEAM-UP, a non-profit initiative with the goal of fostering closer supply chain integration. Alan is one of the principal architects behind the Poseidon program, which has been conceived to radically transform the transportation of pharmaceutical products by sea. This is being achieved through the application of contemporary supply chain best-practice and structured, multi-party collaboration. He regularly presents on this topic and has authored numerous papers. Q. 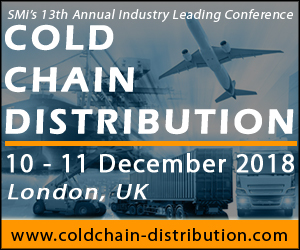 What do you see as the greatest challenges currently facing the Cold Chain Industry? Q. What will attendees hope to gain from your presentation? Q. What future predictions do you have for the Cold Chain Distribution process? He will be introducing the POSEIDON integrated supply chain model, the structure and principles behind a world-class pharmaceutical cold chain.